Replenishment is truly the most critical function of any warehouse. With the help of the right replenishment methods warehouses can not only deliver orders consistently on time but also save cost and manpower. Planning replenishment function for a warehouse is easier said than done. If not managed properly the task of replenishment becomes a time-consuming affair. It is crucial that the pickfront of the warehouse is timely replenished. Any failure to do so can lead to a shortage of stocks in the pickfront, leading to wastage of effort and time in finding the products in the warehouse and cause shipment delays and customer dissatisfaction. With the help of an efficient replenishment method in place; the right balance for picking efficiency and replenishment labor can be achieved. The replenishment methods supported by your WMS system should be flexible enough to account the type of products involved, warehouse lay-outand also the organizational needs. This method can be started in online or batch mode. Maximum and minimum replenishment quantity is set for every product individually. The system is triggered only when the product stock count gets lower than the set minimum quantity. The system then replenishes to the maximum set quantity. The mechanism of this system is similar to the previous method but as this is usually used for products that are fast moving replenishments can be triggered anytime during the day. To manage the system dedicated resource planning is required. Here only the specific quantity of stocks are moved that is required to fulfill the requirement of each wave or day. When stock on hand is less than the demand quantity the system triggers replenishment. At times, exceeding the maximum bin quantity is possible, depending on the order size. This replenishment method is well suited for industries that have fluctuating demand. The demand replenishment can be launched in batch or online mode. SAP EWM function used in this method is Order Based Replenishment. This method of replenishment is used as the name suggests in case of emergency. A picker in certain situations triggers it manually. For instance, when the picker gets stuck in at a bin, as it does not have the correct product or quantity, this replenishment method is used on the fly. 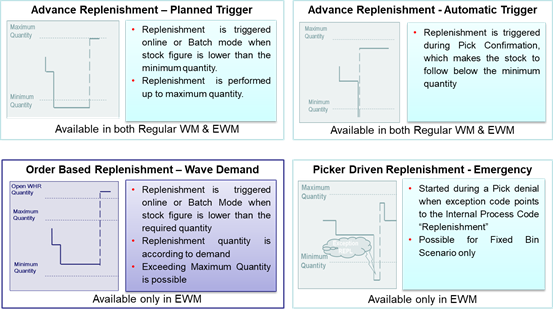 SAP EWM offers Picker Driven Replenishment function for this method of replenishment. You may also check out the following webinar link on the same topic.